Here we are again with a new "Anything Goes" challenge at Lil Patch of Crafty Friends! 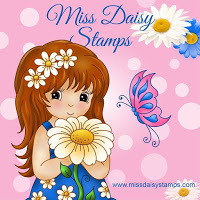 This time we have the most gorgeous images from Miss Daisy Stamps! My choice for this challenge is Lulu by Miss Daisy Stamps and she is so lovely (and easy!) to colour. Please take a moment to join us at Lil Patch of Crafty Friends and share your talent with some amazing people! I'm also delighted to enter my card in these wonderful challenges! 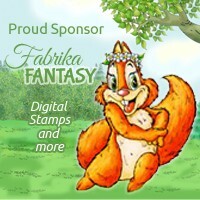 Labels: Copics, Lil Patch of Crafty Friends, Miss Daisy Stamps, Paperartsy, Polychromos, Stampin' Up! Such a darling card, Tracy, and SO BEAUTIFULLY colored! The shine in her hair, and the happy, pensive expression, make me feel delighted, as well! Super sweet! Thank-you for joining us at the Crafts Galore Encore Challenge "Anything Goes". Please check back to see if you are a winner! This is adorable and your coloring is fabulous - very catching to the eye. Thanks for your entry into our Love To Scrap challenge. Hi. Your card is lovely, so cheerful in its design and colours. Just a bit worried as you have been over to my blog and reminded me to become a follower of Lil patch of crafty friends, but I am already! Hope it shows up somewhere! Super cute card, love the layers and wonderful coloring!